The Commonwealth Court today said it would review a cache of e-mails between the Attorney General’s office and investigators for Louis J. Freeh that the agency claims doesn’t have to release in response to a Right-to-Know Law request. In a 3-0 opinion, the court said an internal review of the records conducted by the OAG’s own appeals officer wasn’t enough for the agency to prove the records are related to a criminal investigation and therefore exempt from disclosure. 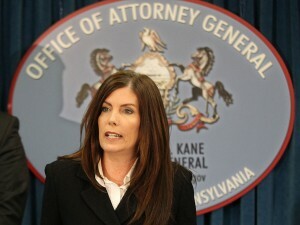 It ordered Kane’s office to file the withheld records under seal by Dec. 20 so it can determine if they must be released. The order stems from a RTKL request for correspondence with Freeh investigators submitted in December last year. The OAG’s open records officer denied the request, and attorneys for Bagwell appealed the decision to Appeals Officer Linda Dale Hoffa in January. After the agency recovered millions of deleted e-mails during its internal review of the Jerry Sandusky investigation, Hoffa ordered staffers to search for more records among those that were recovered. About 20 more responsive e-mails were found, and the OAG said 15 were not public. Instead of requiring the open records officer to submit evidence of the exemptions, the Appeals Officer personally reviewed the 15 e-mails and found they were related to a criminal investigation. In Pennsylvania, nearly all criminal records are exempt from disclosure. On his own, Bagwell appealed to the Commonwealth Court, which said the OAG didn’t prove the records could be withheld. “All we have are the conclusions that they fell within this provision merely by stating conclusions such as ‘investigative report,’ ‘hiring practices’ or ‘victimization,’ wrote President Judge Dan Pellegrini in the court’s opinion. It’s unclear how many e-mails will be turned over to the court. Other than the 15 that were identified after during the appeal, it hasn’t stated how many were previously found. All filings in the case can be found here. Ryan the Lion! Thank you. Thanks, Ryan. Keep up the great work!